The most advanced radar detector and laser jamming system in the world. Since 1982, the first Speeding Ticket Guarantee and still the only company backing every product with a comprehensive speeding ticket guarantee. You're a fast lane driver. You know you need the best defense you can get against police radar and the latest law enforcement pulse gun laser detection. Looking for a solution that is as elegant and technologically-advanced as the vehicle you drive? Want a virtual force-field of protection and freedom from speeding tickets? Three decades of radar and laser detector perfection! * The first Speeding Ticket Guarantee in 1982. * The first Live Consultation with an experienced K40 consultant who customizes your Radar and Laser Protection System for the way you drive. All K40 products come with a 1 year ticket free guarantee. Drive without limits! 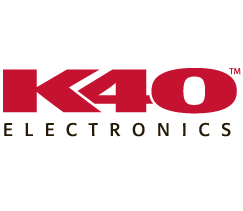 Professional installation available on all K40 products. Give us a call or stop by for pricing and details. Fine Motoring Accessories for Cars & Trucks Since 1978!